There I was on the banks of the Youghiogheny River waiting for my life to come floating by. Actually it was three of my kids and husband in a raft conquering the white water with the rest of their Boy Scout troop. I was doing my mom thing on the shore with the littlest Brye and holding all the towels. I seemed to do that a lot during my kids in the nest days. Stand on the sideline with towels or race bags during a 5 k or in the bleachers at a myriad of sporting events. But I digress. I was waiting and watching for a grand finale as they roared into sight. It was a finale but not a grand one. Right before my eyes the raft flipped over after careening into a large rock. My family was swept into the rushing current while I stood helpless on the sidelines. My oldest flipped the raft off that had trapped him and his sister, and then I watched as he was slammed into a rock smashing his helmet. The rest of the family had assumed the toes up feet first rescue position and continued to bob down the river until one by one they were rescued. It was not pretty. It was the first time I tasted the hard reality that I could not protect my children. And with four serving in the military, it was not the last time I have stood on the sidelines watching them propelled into danger. 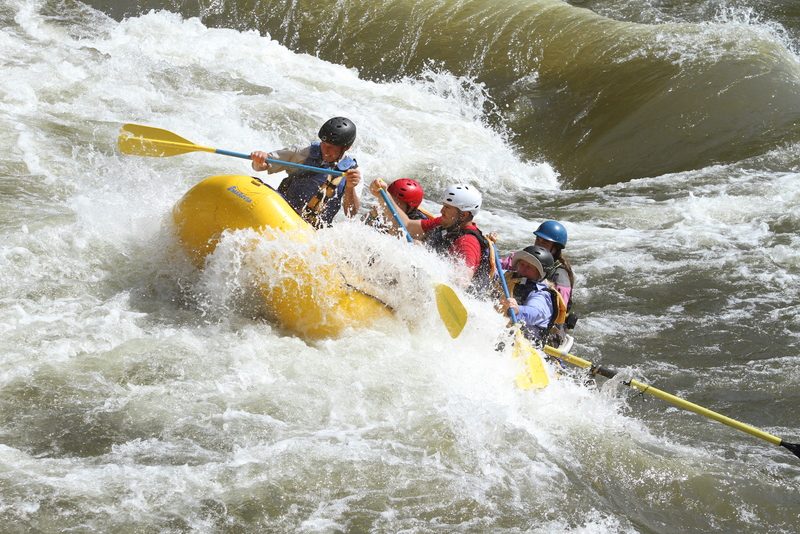 Our ranch in Montana is a half a mile from some of Montana’s premier white water rafting. I knew I had a choice-feed my fear and allow myself to be frozen or face it. With each deployment I choose another fear to attack head on. Conquering those fears makes me feel empowered to face the ones I dare not speak aloud. So I knew I had to jump into that raft and paddle into those rapids. The river was in spring rush when we made the trip. My husband, always up for an adventure, was thrilled that I was actually doing this. As I struggled to get the wet suit on I debated if this was really a wise choice. But soon I was geared up and in the craft ready to launch. I learned from the guide the key to having a safe trip was to paddle on command. In the midst of the biggest rapids it was essential to keep on paddling. On we rolled. As I survived the first one without tears I became more acclimated. By the time we got to the biggest ones I was smiling. Why? Because I learned the key-it was to focus on my job which was to keep on paddling. The work overcame the fear. There was something about being part of the team in that boat paddling together that helped me do something I did not think I could do. What about you? Do you have fears to face? Do you need a team to help you paddle through? I am so excited to announce the first ever “Be Brave and Be Strong Be Safe Love Mom Retreats” here at Rubicon Ranch. Our first retreat will be held September 16-20 and there are five more scheduled next year. Space is extremely limited-only 8 slots per retreat. And yes we will be white water rafting (optional) if you want to take it to the next level. Click below to learn more about it and remember we can practice being brave and strong every day to support our military sons and daughters. But it sure will be fun to do it with other military moms on a Be Brave and Be Strong Retreat. Just remember keep on paddling where ever you are. Looks great E! Congratulations! One note: when you “click here” for retreat info and go to last line in last paragraph before your signature, “all to prepare you “to” support (I believe “to” omitted). (Such a proofreading mother! LOL) Sending love! Sounds wonderful Elaine. I attended several Marine Mama retreats during those long deployments in 2006/2007/2009. We traveled to Pittsburgh, then my Marine Mama friends came to my home in Illinois and finally we headed to Long Island. I couldn’t have survived without them. I’m thankful for those friends who helped me through. God Bless you as you mentor to these mamas.